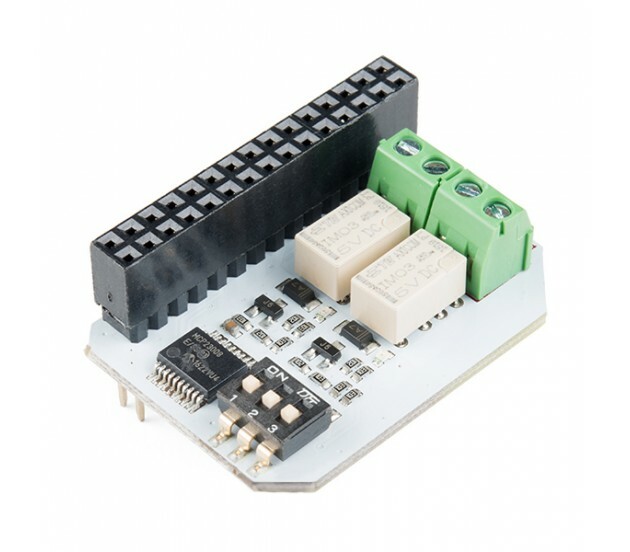 Description: The Relay Expansion Board enables your Omega to control two other independent electrical circuits. The circuits are isolated from the Omega and can operate at much higher or lower voltages, so you can control other circuits you’ve built or small household appliances rated up to 60W. The Relay Expansion Board is perfect for home automation projects because it gives you the ability to control other devices remotely using your Omega. Each Relay Expansion Board features two electromechanical relays that can switch up to 60W and are rated for a maximum current of 2A with a maximum voltage of 220VDC or 250VAC. The screw terminals allow you to connect a variety of different cables, leads and wires. This expansion board also comes with a 3-bit address switch, allowing you to use up to eight relays with a single Omega, meaning you can control up to 16 devices with just one Omega! The Onion Omega boards we carry are separated into three different categories: Mainboard, Dock and Expansion Board. This board falls into the Expansion Board category, meaning you will need an Omega Dock that is equipped with a 30-pin Expansion Header like the Expansion Dock or Arduino Dock R2.